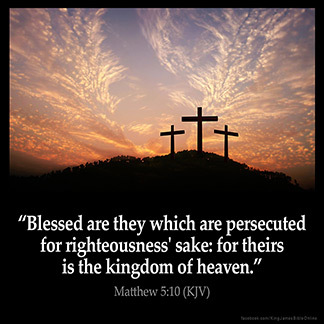 MATTHEW 5:10 KJV "Blessed [are] they which are persecuted for righteousness' sake: for theirs is the kingdom of heaven." 7Blessed are the merciful: for they shall obtain mercy. 8Blessed are the pure in heart: for they shall see God. 9Blessed are the peacemakers: for they shall be called the children of God. 10Blessed are they which are persecuted for righteousness' sake: for theirs is the kingdom of heaven. 11Blessed are ye, when men shall revile you, and persecute you, and shall say all manner of evil against you falsely, for my sake. 12Rejoice, and be exceeding glad: for great is your reward in heaven: for so persecuted they the prophets which were before you. 13Ye are the salt of the earth: but if the salt have lost his savour, wherewith shall it be salted? it is thenceforth good for nothing, but to be cast out, and to be trodden under foot of men. Blessed are they which are persecuted for righteousnesse sake: for theirs is the kingdome of heauen. Happy are those who are attacked on account of righteousness: for the kingdom of heaven will be theirs. Blessed they who are persecuted on account of righteousness, for *theirs* is the kingdom of the heavens. Blessed are they who are persecuted for righteousness' sake: for theirs is the kingdom of heaven. Blessed are those who have borne persecution in the cause of Righteousness, for to them belongs the Kingdom of the Heavens. Blessed are those who have been persecuted for righteousness' sake, for theirs is the Kingdom of Heaven. Blessid ben thei that suffren persecusioun for riytfulnesse, for the kingdam of heuenes is herne. 5:10 For righteousness' sake - That is, because they have, or follow after, the righteousness here described. He that is truly a righteous man, he that mourns, and he that is pure in heart, yea, all that will live godly in Christ Jesus, shall suffer persecution, #2Tim 3:12|. The world will always say, Away with such fellows from the earth. They are made to reprove our thoughts. They are grievous to us even to behold. Their lives are not like other men's; their ways are of another fashion. Mt 5:10 Blessed [are] they which are persecuted for righteousness' sake. The Jews expected a conquering kingdom, and its citizens to be lords among the nations, but Christ pronounces a blessing on those who are persecuted, not for misdeeds, but for righteousness. These shall have the kingdom. Doubtless these words have sustained and cheered many a martyr. It is a war between the flesh and the spirit. A war between light and darkness. People loved darkness be cause their works are evil.